This Thai Peanut Sauce recipe is one of my all-time best. 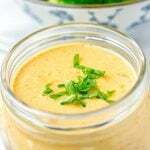 It is ready in under 5 minutes and can be combined with vegetables (love it with broccoli), snacks, or even be the base of a tasty salad dressing. Made with peanut butter, red curry paste, coconut milk, and garlic, it is naturally vegan. In a bowl combine peanut butter, garlic, Thai red curry paste, coconut milk, water, half of the chopped basil. Season with salt and pepper and mix with a spatula until everything well combined. Garnish with the rest basil on top. You can also make this sauce in a blender or food processor, or with an immersion blender. However, I strongly recommend that you do not add the basil from the start – it will make the sauce green. Just add half of the given amount right before the end, and just pulse the mix 1 or 2 times.